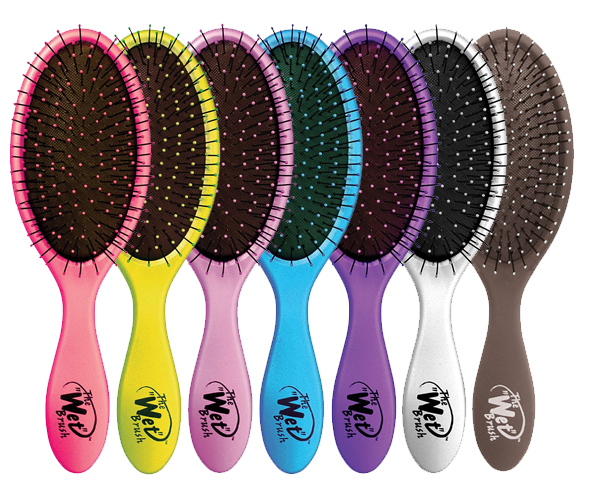 If you haven’t heard of The Wet Brush yet — it’s definitely time you do! Recently, we were lucky enough to get a sample of this brush and we sure are happy we got it! This brush, although it looks the same as many others on the market, is one of a kind! It’s designed to help prevent breakage during detangling and brushing. The super soft bristles bend when a knot is reached and glide right over it as opposed to getting tangled itself tangled into the knot and pulling hair out along with it. Because it glides over the know and then continues brushing the section below, the knot is worked out naturally without breaking or risking the integrity of your hair. Here’s a bit more about the brush and more reasons why we instantly fell in love with it! Feel: I love the ergonomic handle design, it’s super comfortable and easy to use for those who do not like the hand held detanglers like the Knot Genie. The soft bristle pad helps the brush conform to round contour of your head no matter where you are holding it and the soft bristles aren’t rough on the scalp. They glide through so easily that they are almost undetectable. This is the perfect brush for all hair types but would work exceptionally well for hair that delicate and for fragile curly hair! The Wet Brush would also be perfect for anyone who is trying to grow their hair out — because of it’s ability to prevent breakage, it in turn promotes growth. It’s amazing how one brush can do so much for your hair! ← The Ultimate Roller Breakdown!